Making small batches of concrete is now fast and easy with the BNHH-50 Hydro Hoe from BN Products-USA. The Hydro Hoe connects to a standard water hose to more affectively mix concrete in a wheel barrow. The tool makes it easy to provide the correct consistency by adding just the right amount of water while you mix. No more bending over several times to grab a water hose or bucket to add water. Mixing is easy with grips that are placed just right to provide leverage and comfort during the mixing process. The hefty brass water valve is easy to adjust and provides full volume with just a quarter turn of the handle. One person can mix a bag of pre-mixed concrete in less than 1 minute. Many contractors mix small batches of concrete for a variety of reasons and this tool will save them time and money. 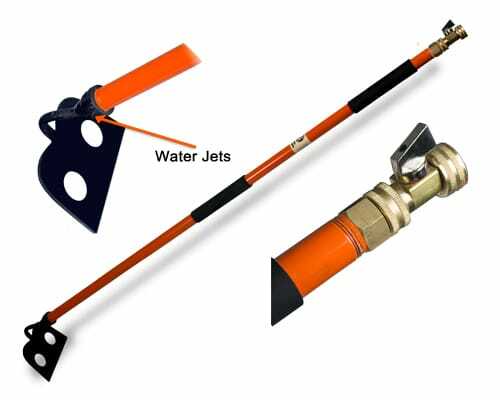 The Hydro Hoe is heavy duty and built specifically for the contractor, but can easily be used by the home owner. The 48" handle is galvanized pipe that is powder coated to last years. The unique head has two water ports that spray water on the back side of the Hoe where it is effectively mixed with the concrete. Industrial brass fittings and valve will provide years of service. then, let us know if you think you can get this tool stocked in your distributors!